Weaver Leather’s first employee still works here today. 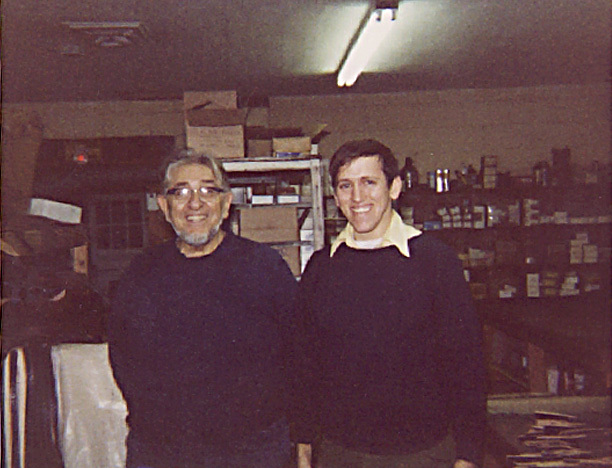 From a small garage where our founder Harry Weaver focused on making shoe repairs in 1973 to today’s 260,000 square foot facility where a team of over 300 manufactures, distributes and markets products for our supply, equine, livestock, pet and arborist divisions, we’ve come a long way in 45 years. In the beginning, it was Harry running the business with the help of his wife Sarah and his youngest son David. Harry soon saw the opportunity to expand into other markets and attracted his first customer of manufactured leather goods who remains a customer to this day. As demand grew, Harry hired his first full-time employee, Myron Stutzman, who is now in his 44th year with Weaver Leather. More and more of the new company’s time was spent manufacturing leather goods and shoe repair work ceased. Harry’s second customer expressed an interest in buying leather horse halters. After researching what customers wanted and what would sell well, manufacturing of leather halters began, opening the door to sell to harness and tack shops in the area. Throughout the late seventies and early eighties, additions were made to the original garage to accommodate for increased manufacturing and inventory needs. In 1981 Vernon and Paul, Harry and Sarah’s oldest and second oldest sons, joined the company. Vernon became very talented and knowledgeable regarding the company’s sewing machines which would serve him well later as our machinery sales manager and resident machinery expert. Paul became actively involved in helping his father manage all company operations, growth and future plans. Paul was appointed president in 1983, the same year Weaver Leather began distributing a variety of leather and hardware. Harry passed away suddenly in 1984, but his strong work ethic and commitment to producing quality products remain the bedrock of our company to this day. Eventually in need of more space, a new 12,000 square foot building, the beginning of today’s facility, was constructed in 1987 to house all Weaver Leather’s manufacturing, warehousing, shipping and customer service operations. With a growing need to serve a variety of customers with varying product interests, Weaver Leather produced its first Supply Catalog in 1990 featuring 36 pages of leather, hardware, tools and supplies. As the years marched on, we continued to develop new products, create catalogs, serve customers to the best of our ability, build websites and expand our facility to accommodate it all. We unveiled the Weaver Leather Craft Supply website in 2016 to provide our quality supply products at retail prices to leather crafters. Packed with valuable tips and easy-to-follow project tutorials, this website is a great resource with the goal of enhancing the creativity of leather crafters while providing the right products to ensure project success. With 45 years under our belt, we are now poised for the future. Paul recently passed the torch to Jason Weaver, his nephew and Vernon’s son. As the new CEO, Jason brings a fresh perspective to the company while staying true to our past. Quality products, exceptional service, and an unwavering commitment to strong character are at our roots and we wouldn’t have it any other way.